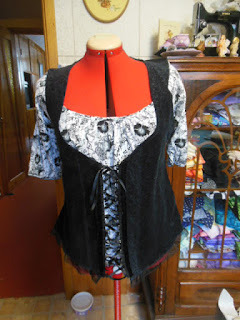 I used a stretchy fabric corset style top I found for the inspiration of this alter. 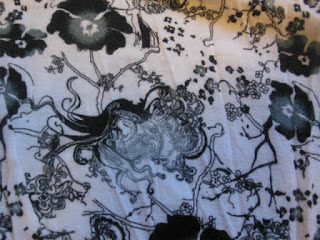 Loved the style but not the fabrics. 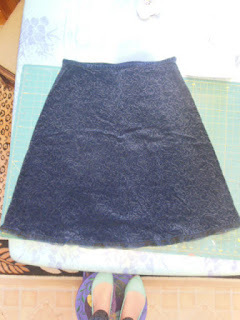 I took the top apart and copied the pieces on to paper, adding about on 1" as I was using a non-stretchy skirt for the body of the top. This velveteen skirt with a sheer trim was an awkward length for little ole me. It fit good (whew), but I added two little strips to the front. 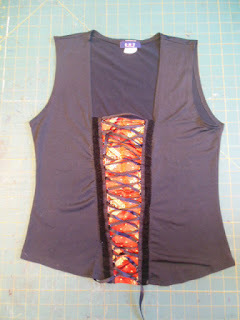 I used the corset closure off the stretchy top, and the zipper out of the skirt. The zipper allows me to wear the top without having to undo all the laces. The top that I used for the fake underneath was one that I fell in love with because it is covered in lady heads. but I couldn't walk away from these lovely ladies! 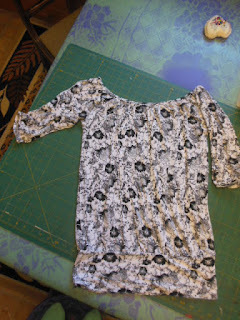 I sewed the sleeves in and the fronts together. The rest of the top was cut away and stashed for another day. Three unwanted items equal one new loved piece. That took some imagination. I really like how it turned out.